We finally got around to posting the good-looking, professional photo of our award for innovation in game design (woo!). 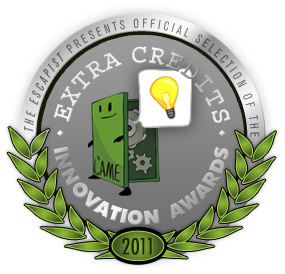 We’ve been nominated to win an Extra Credits Innovation Award (http://www.escapistmagazine.com/content/login/)! Wish us luck! It is a renaissance moment, an epiphany, a brilliant idea that takes root in your soul and colors everything you do. You are eager to communicate this idea to anyone who will listen. You address a group of your friends but they don’t really understand, turn away, and stop listening. It seems so clear and simple to you. You finally manage to get someone alone and describe your idea. They listen. They get it. They follow you. Now they are colored by it too. Together you have a greater voice. More people listen. They understand. They join. Other ideas, contrary, competing, ideas that promote exactly the opposite of what you know to be true are also being promoted. Other voices, competing for an audience, move through the population trying to convert the masses to their movement. Converts work tirelessly to recruit new members, approaching them in groups and swaying them with sheer numbers. Your world is filled with the rich color and music of diverse ideas being exchanged, debated, accepted, converted, rejected, and adopted. Some movements are fast but not coordinated. Other are slow and resistant. Some are very agile, quick to change course and join together. Your world is filled with the joyous and chaotic music of the renaissance. Each idea attempts to prove itself to be the only truth. In the end there is no room for compromise. Only one philosophy will prevail. The rich exchange of ideas, the diversity of viewpoints, the unparalleled heights of discourse are finally dominated by a single, unified idea. The void is filled with a single note. The chaos is replaced with order and there is only one color. Time for a new idea. We’re looking to hire a PR/Community person at our studio. This person would be able to, when we release a game, go through their rolodex and in a week we’d have a dozen reviews and developer interviews on indie game websites. The rest of the time, this person would be a community manager, keeping our twitter feed, blogs, facebook fan pages, and website fresh and up-to-date, and building our fan community and interacting with the public. A little about our studio: Blanket Fort Games is in Ithaca, NY, and we split our time between working on our own games and doing contract work, which is not always game related (our non-game work is done under the name ActionXL at http://www.actionxl.com), to supplement our revenue. We are still quite small, with only four full-time employees, but we have several exciting projects on the horizon, and intend to grow steadily. Due to popular demand, we have created a demo version of influence. 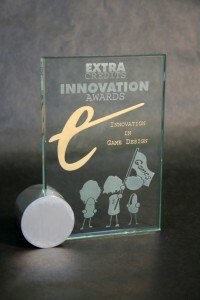 We hope the free demo will encourage people to try the game, and play online with their friends. The demo is ego-limited, only allowing players to spend one ego point customizing their ids. Download the demo using the link below. Whoops! It seems there was an error with the demo version. We have fixed it now, and we apologize for the inconvenience. Woooooooo! After many trials and travails, influence is available for purchase at Direct2Drive! Go to http://store.steampowered.com/app/731430/influence/ and buy many copies! Also tune in to us at http://twitter.com/#!/blnktfrtgms for influence news as well as news about our next project. Skipped a few there. Betas 4 and 5 were minor bugfixes addressing issues we found during our various internal tests. The game no longer sometimes hangs at the end in online play, invalid names now prompt the user to enter a new one, the connecting screen in the online game list no longer freezes the system while it connects, and other, similar bugs. Beta 6 extends the expiration date to the 30th. If you are playing the beta, please send me bug reports and any other feedback you have. I have just uploaded Beta 3, which includes a number of improvements requested by our testers. The camera problems are significantly improved, and there is an option to turn off the zoom in at the start of each game. Additionally, music volume is now a slider instead of a switch. A number of other multiplayer instabilities have been repaired, as well. Please download the updated version for further testing. In other news, we will be having a media play of the game this Friday, December 17, at 2:00PM Eastern Time, where we invite indie game reporters, bloggers, etc. to play with the developers and chat about the game. If you would like to participate, please let me know. I have to admit, I was disappointed by the amount of crashing that went on at the Cornell beta test. The players weren’t too phased by it, having developed beta stage games in the past, but it was still less stable than I hoped. Fortunately, when I returned to the office on Monday, my inbox was full of stack traces for these crashes. I have now been through them all, and am happy to release Beta 2. Beta 2 should have most of the instability fixed, but has few of our planned gameplay fixes and improvements, which is to say, the camera is still a bit wonky. Please update to this version for future testing. We had a great time with the DGA beta testing influence, playing a bit of single player and a lot of multiplayer. We played free-for-all, 3v3, 2v2v2, 2v2v2v1, and our first-ever eight player game. We also found plenty of bugs to fix over the next couple of weeks. I have sent Sam Dannemiller an access key to download the beta (and future versions of the beta) to forward to all attendees and other interested club members. Thanks again go to the DGA for organizing this successful event.